In its manifesto released on Saturday, the Opposition party said it will prohibit holding RSS members in government premises and cancel the order that allowed officers and employees to participate in schools. The Congress party on Sunday has pledged to revoke the order, allowing the government to take part in activities of the National Swamy Shiva Sangh (RSS). "RSS is a political organization. If the Congress party in MP has said it will end an end to this practice, I see nothing wrong with that Government servants, as long as they are working with government, should not openly associate with a political party, "Senior Congress leader P Chidambaram said. Hitting out at the party over the issue, BJP spokesperson Sambit Patra said, "Looks like the Congress is the only motto:" We will allow the construction of temples nor the functioning of RSS ". The ban was first imposed by the Congress party in 1981 and revived in 2000, when Digvijaya Singh was the chief minister. 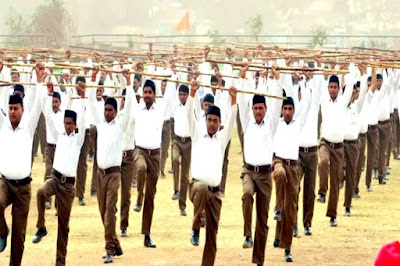 The order warned employees of disciplinary action under M P Civil Service (classification, control and appeal) rules of 1966, if they were found in RSS shakhas or the organization's other activities. In September 2006, CM Shivraj Singh Chouhan lifted the ban saying RSS is a socio-cultural organization and not a political entity.